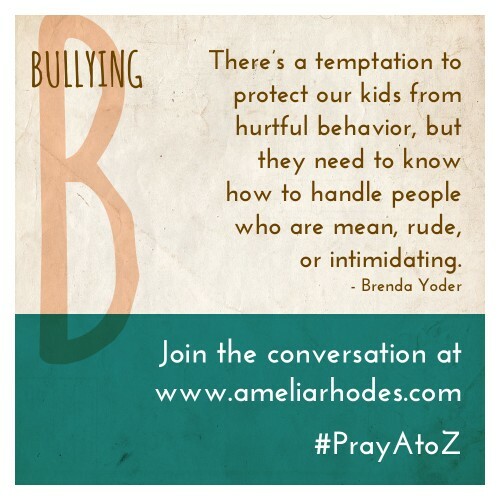 This is the 2nd post in the Pray A to Z series, and B is for Bullying. I will be posting each new letter and topic on Mondays and Thursdays through the end of the year. Catch up on this series with the introduction post, and A is for Adoption. If you don’t have the companion prayer cards, you may download them here for free. Today’s Prayer focus is bullying. Open the news on any given day and you’ll find this topic under discussion. While it’s prevalent among schools, adults also face intimidating behavior in the workplace, and yes, sometimes even in our Christian circles. My friend Brenda Yoder, a trained counselor who also works as a middle school counselor, is sharing with us today. Bullying is a trending buzzword. But it’s so over-used we tune it out. As a counselor who educates, equips and responds to bullying behavior and peer conflict in schools, here are ten truths I want you to know about bullying. The definition of bullying by law in my home state identifies 5 specific characteristics. Bullying happens when someone repeatedly harms someone on purpose, over time, where the behavior is unwanted and there’s an imbalance of power in the relationship. All five qualities have to be present in a situation for it to be determined as bullying. Saying, “He’s bullying me” for every mean, aggressive or intimidating behavior makes the word overused and watered down. Bullying happens when the offense repeatedly occurs over time with an imbalance of power, and when the behavior isn’t two-sided. Kids and parents often use it when a child is teased, when there’s peer conflict, or when someone is rude or mean. Overuse of the word diminishes the severity of identified bullying, which is harmful for those who truly need help. 3. Throw away the “everyone’s nice”dream. There’s a temptation to protect our kids from hurtful behavior, but they need to know how to handle people who are mean, rude, or intimidating. They’ll encounter them on sports teams and in the workplace. People will be mean, so we need to teach our kids appropriate ways respond. 4. Empower your child to set boundaries with others who aren’t respectful to them. It’s common to talk with our kids about friendship and kindness, but we often fail to give them permission to set boundaries with others who aren’t treating them right. Teach appropriate boundaries to have with peers and adults who aren’t respectful in behavior or speech. 5. Empower your child to be assertive when necessary. Assertiveness generally isn’t taught in Christian circles because we’re taught to be kind, humble and to turn the other cheek. Kids, teens, and young adults need to know how to be assertive in protecting themselves both physically and verbally. Model assertive phrases your child can say to a classmate, friend, or adult who speaks disrespectfully to them or someone else. 6. Use common techniques for bullying or situations where boundaries are crossed. Teaching your child to walk away or ignore mean behavior in the moment gives your child power to not stand and take unwanted behavior from someone else. Other techniques include changing the subject, using humor, telling the aggressor to stop, or using a poker face. 7. Telling a trusted adult should always be an option for a child. Kids are often afraid to tell an adult because they’re told not to tattle or they’re afraid the aggressor or bully will retaliate. Empower your child at any age to tell an adult they trust whether they’re a bystander or experiencing bullying behavior themselves. 8. Bullying is in the power and control behavior family, in addition to relationship violence, verbal and mental abuse, sexual abuse or assault. Teaching these skills to your child are critical not just for the playground, social media, or the bus stop, but for similar situations in life where they need to protect themselves, even as adults. 9. Your child might be part of the problem. We tend to focus helping a child if he or she is the target (a preferred word over victim), but Christian kids can be part of the problem as a bystander to the behavior, the bully’s henchman, or the bully themselves. All kids have a sin nature and can participate in bullying behavior or condone it by silence. Non-Christian kids have often told me that “churched kids” are some of the meanest kids in a peer group. If you hear your child is involved in bullying behavior, don’t ignore it or explain it away. Accept it, walking with God in His grace to bring accountability, repentance, and restoration to your child and the others involved. 10. Empower your child with strength through prayer, God’s Word, and the Holy Spirit. Add names of children you know who might be the targets of bullies, and those who might be doing the bullying. Pray for the children in your community to be alert and empowered to stand up for those who are being bullied. Pray for teachers and parents in your communities to be proactive in teaching children the signs of bullying and how to respond. Pray for kids with aggressive, mean behavior in your community and that their hearts might be reached with God’s love. Find out if there are any organizations in your community who are educating and providing resources for anti-bullying. Such great words of wisdom, thank you. 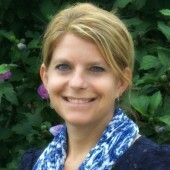 Thanks for reading and sharing these posts, Lisa!